I feel like I've been gone for weeks but it's only been a few short days. I took a mini vacation away from home and got to play in the sand and refresh myself in the waves. There is nothing like summer on the shores of Lake Michigan. Of course there's nothing like winter here too, but I'm not thinking of that right now. I completed my Great Granny quilt top. I'm so pleased with the way it came out. The cherry fabric I used for the sashing and borders is one of my favorite go-to prints and I always have it in my stash. It is from JoAnn fabrics and is really a good quality quilting cotton. It pairs so well with the "Sew Cherry" fabric by Lori Holt and compliments the aqua around the blocks so nicely. The quilt measures at a 50" square. I can hardly wait to get it into the hands of my quilter/friend Mary. I have some fun things planned for the back to use up the leftover 2 1/2" squares. I'm trying to decide if I should bind it in red with white polka dots or use the same cherry fabric. What do you think? When I look at this quilt I think of summertime and picnics, cherry picking and all the cherry orchards I pass when I travel home to see my family here in Michigan. 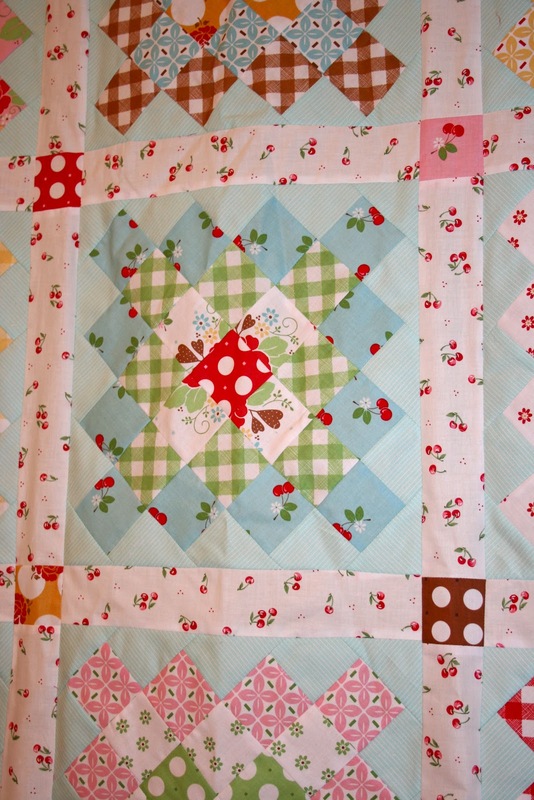 Very pretty, cheery, cherry quilt top! And it will be fun to quilt too! Love your fabric selections, Renee! Very sweet quilt top! I love the cherries, I would bind in them, or maybe an aqua~? Whatever you choose will be wonderful! Beautiful quilt! I love your fabrics. You have a wonderful eye for color. 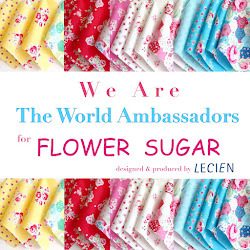 I have some of that cherry fabric in my stash and I'd love to use it like you did - great job. I think yours is my favorite granny I have seen!! Absolutely adorable. Love it. I wish I had time to do one. Yours seemed to go fast. The cherry fabric is so cute. I would use the red polka dot for the border. Either way, it is a winner in my book. The red w/white dots would be stunning as a finish/binding! 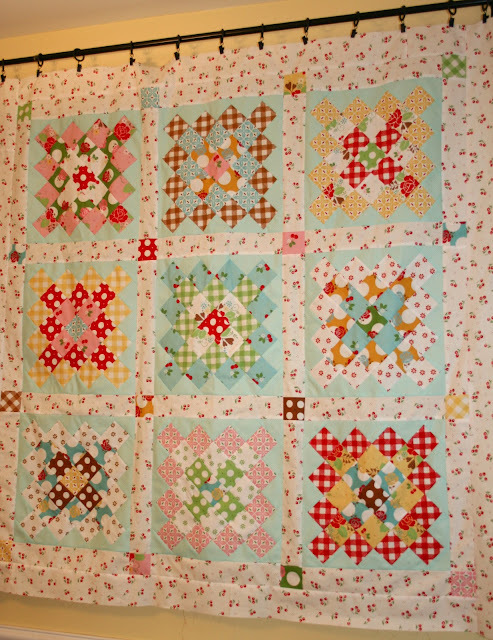 Love this quilt (I have since you began posting the blocks).....the finished project does not disappoint! The rod you are using to hang the quilt is like the one I purchased today to hang on the high wall leading up our stairs to the 2nd floor of the house. Wasn't aware that such tension rods were even made, until I was at Menards (building supply) and spotted them! So neat! What a beautiful quilt - just love those little cherries! The red and white polka dot. I think that would give it that pop of color and tie in all the red from the cherries. Just my humble opiniion. Great design, love the fabrics. Can't wait to see it when it's finished. Yummy! Red with white dots or Aqua - IMHO lol It's going to be a stunner for sure when done!! Since the quilt is busy, I think a solid red binding would accentuate the cherries and make the quilt pop! I'm working on a very similar Granny Squares quilt for my grandson who will be born in mid September. It is such a fun, easy pattern with so many variations. Your quilt is so adorable. I think the red polka dot pattern would make a lovely contrast on the back. Your friend should be so pleased!! Beautiful! I'm making some of these, too, but I only have 6 made so far. Yours are just perfect!